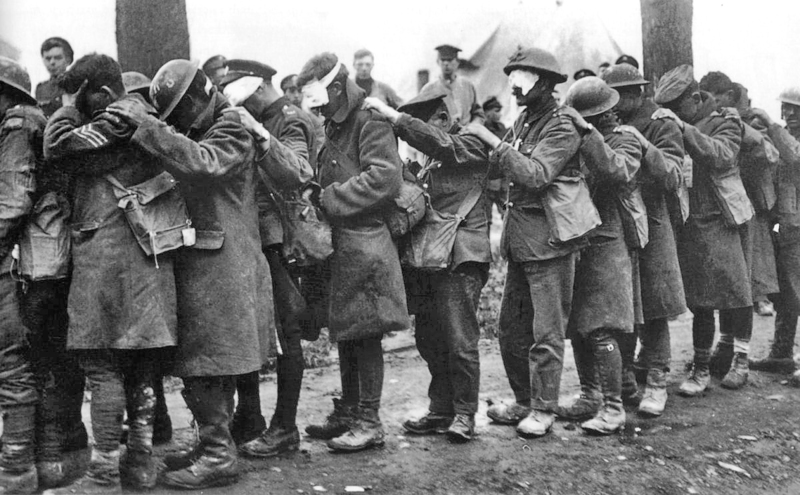 During the World War I, a new, deadly type of weapon was used for the first time; toxic gas. Considered uncivilised prior to the war, the development and military usage of poisonous gas grenades was soon called for by the demands of both sides to find a new way to overcome the stalemate of unforeseen trench warfare. First used at the Second Battle of Ypres on 22 April 1915, cylinders filled with toxic gas soon became one of the most devastating and effective weapons used in the entire Great War, killing more than 90,000 soldiers and injuring about 1.25 million. In this article, we are going to explore the 4 of most deadly chemical weapons ever conceived, their history, usage, and effects on the human beings. While Germans were releasing the mustard gas in year 1917 near the Belgian city of Ypres for the first time, chemist Frederic Guthrie was most likely turning in his grave. In year 1860, this British professor discovered the mustard gas, and also experienced its toxic effects first-hand for the first time. 57 years later, after its first military usage at Ypres, it got its infamous nickname, Yperite. 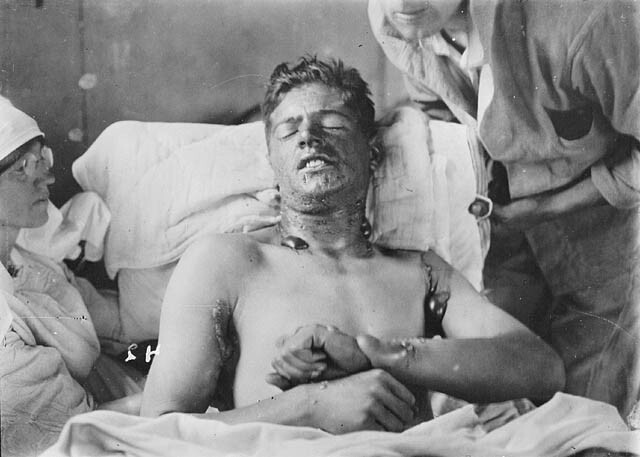 In the beginning, Germans planned to use the mustard gas only as a paralyzing agent. However, they soon found out, that when in sufficient concentrations, this gas could be easily lethal to the majority of the enemy soldiers. Due to its dangerous properties, mustard gas soon became a popular chemical weapon, used in WWII, during the North Yemen Civil War, and even by Saddam Husein in year 1988. Even 150 years after its discovery, antidote is still to be discovered. Pure mustard gas is colourless, oily liquid at room temperature. When used in its impure form, as warfare agent, it is usually green-brown in color and has an specific odor resembling mustard or garlic, hence the name. Yperite fumes are more than 6 times heavier than air, staying near the ground for several hours, effectively filling and contaminating enemy’s trenches, and killing everyone without proper protection. Lethal dose for an adult man weighing 160 lbs is approximately 7,5 g of liquid mustard gas, when in contact with his skin for several minutes. However, when used in its gaseous form, lethality greatly depends on its concentration and on the length of exposure. Gas mask is usually not enough to be protected from this gas; it can easily penetrate the skin and kill the victim from inside. It easily passes through most of the clothes, shoes or other materials. For instance, standard rubber gloves could protect the skin for only about ten minutes. 4 or 6 hours after exposure, burning sensation appears in the affected areas, followed by reddening of the skin. After next 16 hours, large blisters appear on the affected skin, subsequently causing severe scarring and sometimes even necrosis. If the eyes were affected, temporary or permanent blindness typically occurs after few days. When inhaled, first symptoms start to manifest themselves after several hours, starting with chest pain, bloody coughing and vomiting, followed by muscle spasms. Death usually occurs within 3 days, caused either by lung edema or heart failure. In year 1812, 22-year old British amateur chemist John Davy syntetized the phosgene gas for the first time. However, it didn’t contain any phosphorus, its name was derived from greek words phos(light) and gennesis(birth). John Davy probably assumed that his invention would be used in a more sensible way, however, on 9.th of December, 88 tons of phosgene were released during the trench warfare in France, killing 69 men and seriously injuring more then 1,200. Germans were satisfied by the results, so they soon started using grenades filled by phosgene in combat. It accounts for more than 60% of all deaths caused by the chemical warfare during the First World War, more than chlorine and mustard gas combined. During the Second World War, most soldiers were well-prepared for the possible use of this deadly gas, so the casualties were nowhere that high. However, phosgene-filled grenades used during the 1942 Battle of Kerch by Nazi Germany allegedly injured at least 10,000 Soviet soldiers. Which deadly properties does this gas possess? At low temperatures, it is a colourless liquid. However, when heated to more than 8 degrees celsius, it evaporates quickly. Its odor has been often described by the survivors as pleasant, similar to newly mown hay or wet grass. After release, it contaminates the area for about 10 minutes, double the time in the winter. When compared to chlorine, phosgene has a major advantage; first symptoms start to manifest themselves after much longer time period, usually after more than five minutes, allowing more phosgene to be inhaled. After one inhales high concentrations of this lethal gas, his chances of survival are very mild. After few minutes, he is likely to die of suffocation, because phosgene aggresively disrupts the blood-air barrier in the lungs. After inhaling less concentrated phosgene, you might be little bit better off. One hour after exposure, first symptoms include strong burning sensation in pharynx and trachea, severe headache and vomiting, followed by pulmonary edema(swelling and fluid buildup), which often leads to suffocation. 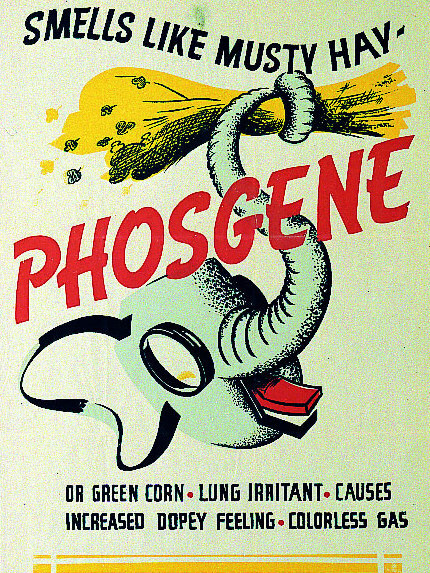 To this day, phosgene remains one of the most dangerous chemical weapons in the world. Although not as deadly as sarin or nerve gas, it is very easy to manufacture; no wonder it’s often used during terrorist attacks. Homemade phosgene grenade can be easily created by exposing a bottle of chloroform to UV-light source for a few days. If previous two chemicals weren’t dangerous enough, here comes the sarin, often known as the most powerful of all nerve agents. Sarin was developed back in 1938 by a group of 4 German scientists, Scharder, Ambros, Rudiger and van der Linde, during their research of pesticides. During the WWII, this deadly gas was first used by the Nazi Germany in June 1942. At the end of the war, Germany allegedly possessed more than 10 tons of sarin. However, it is most famous for being used during the 1995 terrorist attack on the Tokio subway by a Japanese cult Aum Shinrikyo, killing 13 people and allegedly injuring more than 5,000. It was also used back in August 2013 by al-Assad’s forces in Ghouta, Syria, killing more than 1,700 people. Sarin belongs to the group of nerve gasses, the deadliest of all toxic gasses used in chemical warfare. It is highly toxic; a single drop of sarin the size of the head of a pin is enough to kill an adult human. In addition, most of the victims usually die few minutes after contamination. It usually enters the organism via respiration, but it can also penetrate the skin or be ingested. In home temperature, sarin is a colourless liquid without significant odor, similar to water. However, when exposed to higher temperatures, it starts to evaporate, being still odorless. After release, it often remains deadly for more than 24 hours. Immediately after exposure, first symptoms include strong headaches, increased salivation and lacrimation(secretion of tears), followed by gradual paralysis of the muscles. Death is caused by asphyxiation or heart failure. According to some sources, Sarin is 500 times more deadly than kyanide, with its lethal dose being only about 800 micrograms. 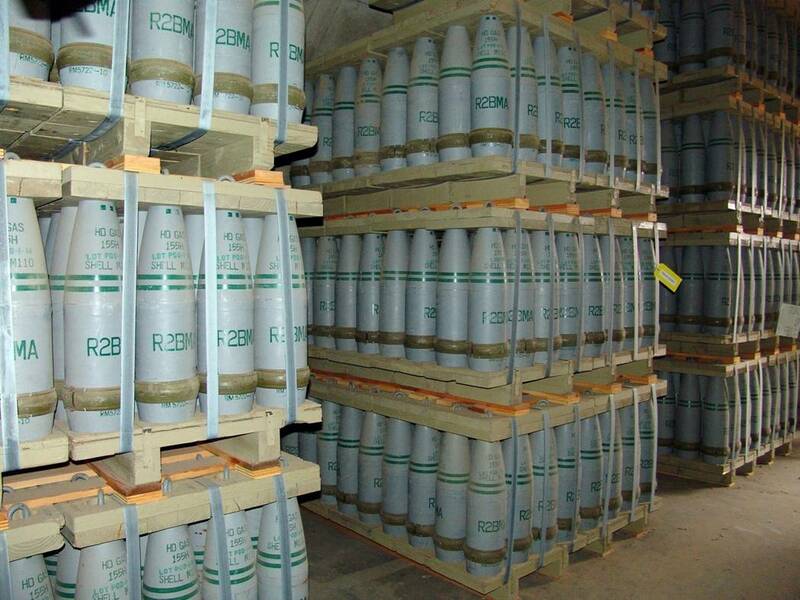 Only 5 tons of sarin, obiviously properly dosed, would be enough to wipe out entire humanity. This mixture of two herbicides, most famous for its usage in Vietnam War, is not a chemical weapon in the true sense of the word. It was discovered in year 1943 by American botanic Arthur Galston. In year 1951, further research started by the scientific team in the military base of Detrick, Maryland. During the War of Vietnam, it was widely used for deforestation of the large areas covered by thick jungle, to enable easier and more effective bombing of enemy bases and supply routes. Although designed as herbicide, the Agent Orange also contained large amounts of dioxin, a highly toxic compound, making it one of the most deadly chemical weapons ever deployed. In years 1962-1971, military operation with codenames ”Ranch Hand” or ”Trail Dust” took place in Southern Vietnam. 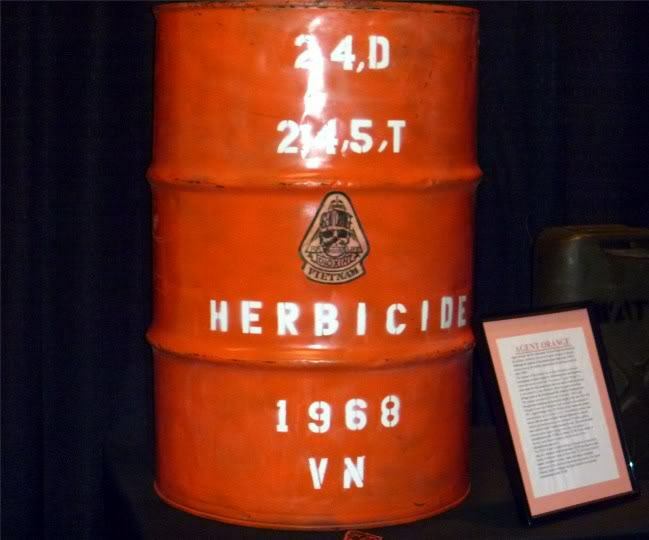 During this operation, jungles in the region were heavily showered by this herbicide, primarily in the areas of Mekong delta. Mixture was storaged in orange barrels, hence the name ”Agent Orange”. During the operation, more than 20 million gallons of this dangerous chemical were used, destroying large areas of jungle, contaminating air, water and food sources. In high concentrations, dioxin causes severe inflammation of skin, lungs and mucous tissues, sometimes resulting in chronic obstructive pulmonary disease, pulmonary edema, or even death, however, it also affects eyes, liver and kidneys. It is also highly effective carcinogen, known for causing laryngeal and lung cancer. It is estimated, that the usage of Agent Orange during the Vietnam War led to more than 400,000 people being killed or maimed, and 500,000 children born with mild to severe birth defects as a result of contamination. Agent Orange alone killed 10 times more people than all other chemical weapons combined.